If you are considering having your concrete floor coated, you want to consider use a green epoxy floor coating. Many coatings you will find have a high level of Volatile Organic Compounds also known as VOC’s. VOC’s can be found in many products throughout your home and business, however they can be dangerous to both your health and the environment. This is caused by molecules entering the air, although you may not notice the effects of VOC’s immediately, they can have an effect on your health that can cause health issues in the future. Prestige Floor Coating provides customers with green epoxy floor coatings that look good and won’t cause damage to your health. Our specially formulated concrete floor coating is a green epoxy floor coating, meaning it is a VOC free floor coating. We have made a specialized floor coating that is an environmentally friendly floor coating which is especially designed for the Mid-Atlantic climate. This green epoxy floor coating is an industrial strength coating that is 800% stronger than concrete. Using our green epoxy floor coating lets you be assured that your flooring is not letting off particles and gases that will affect those living and working around the area, whilst giving you a floor that is slip resistant and resistant to stains and impact, including chemicals. You can enjoy a strong floor that you know is safe and environmentally friendly. Our floor coatings can be applied in any temperature and is made for both indoor and outdoor environments. It can stand up to UV rays and inclement weather without yellowing and fading. Coating your concrete floor can also turn a dull concrete floor into a work of art, with many styles and colors to choose from, you can choose to have your floor blend in, or stand out. 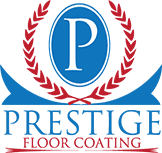 If you are looking for a coating for your concrete floor that is environmentally friendly, contact us today at Prestige Floor Coating. We believe that our green epoxy floor coating is superior to others on the market and will provide you with a beautiful floor for years to come.